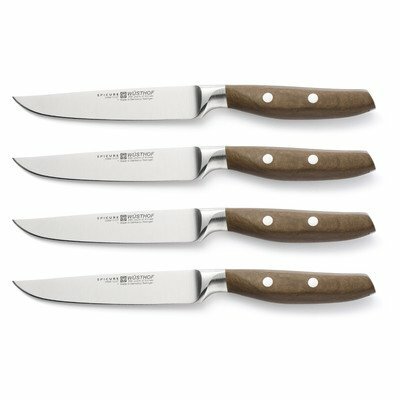 Wusthof Epicure 4 Piece Steak Knife Set 8969 by Wüsthof at Sara Stage. MPN: 8969. Hurry! Limited time offer. Offer valid only while supplies last. 8969 Features: -Ergonomic handle for optimum comfort. -PETec edge. -Precision-forged, full tang cutlery. -Epicure collection. Handle Color: -Brown. 8969 Features: -Ergonomic handle for optimum comfort. -PETec edge. -Precision-forged, full tang cutlery. -Epicure collection. Handle Color: -Brown. Blade Material: -High carbon stainless steel. Handle Material: -Wood. Number of Items Included: -4. Pieces Included: -Steak knife. Dimensions: Overall Product Weight: -1 lbs.